Fair. 0465020372 Item in acceptable condition including possible liquid damage. As well, answers may be filled in. Lastly, may be missing components, e.g. missing DVDs, CDs, Access Code, etc. Acceptable. COVER HAS HEAVILY WORN CORNERS & EDGES. INNER PAGES APPEAR TO BE IN GOOD CONDITION. STAINS ON THE OUTER EDGE OF PAGES. *Acceptable condition: -Used books can include heavy writing, highlighting, underlining, marking, or notes. Exterior may have moderate to heavy signs of wear from use or shelving (worn corners, creases, scratches, etc). Cover may be different than listing and may have sticker / sticker residue. May have binding wear / seperation. May have Water Stains and / or Damage. All pages appear to be readable. Some pages may have folded / creased corner(s). ISBN number may not match-it may match original at bottom of barcode. May have stains on inner pages and / or outer edge of pages. * Paperback Used-Acceptable. Fair. Ex-library book with typical markings. Pages are clean and easy to read. Ships fast with tracking. Mark Thompson's history of the fighting on the Italian Front during World War I skillfully combines military maneuvers, political machinations, and cultural background. A balanced, incisive, and readable history. 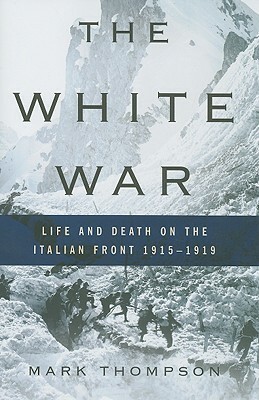 Among the book's strongest sections are those dealing with the writers, including Svevo, D'Annunzio, and Gadda, who were involved in the fighting. Thompson's assessment of the average Italian soldier's motivations and experiences on the front are persuasive and balanced, and help foster a deeper understanding of the interplay between regional and national identities in the still-young unified Italy, and the tragedy of war. This is a superb work of history that enriches the vast literature of the Great War.